Tyna with Mike Galyan at a recent planning meeting. After graduation, I became a wife and within ten years, a mom of 6 children. Needless to say, I was a “stay at home mom” for 20 years, growing up with my children. Thanks to a good friend, I was offered a part-time job with the court system in Danville, which eventually became full time. I really enjoyed my job, made some good friends and learned a lot about life and the judicial system. 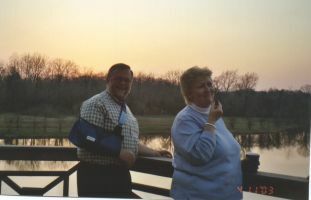 I retired in 1998 and David and I spend a lot of time traveling to Tennessee visiting friends. Last, but certainly not least, we have been blessed with 25 grandchildren, ranging in age from 18years old to 10 months old. They are great rewards for growing older. 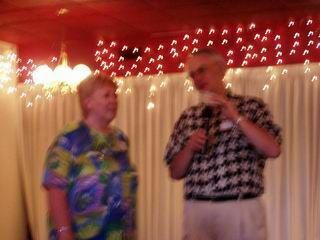 Tyna with husband David Boles at 40th reunion. 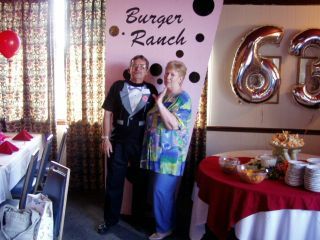 Tyna receiving award for most kids(6) and most grandkids(27).